MANILA, Philippines - Expect more drug killings throughout the term of President Duterte, who admitted yesterday that he had miscalculated the extent of the drug menace and his capability to stop it. 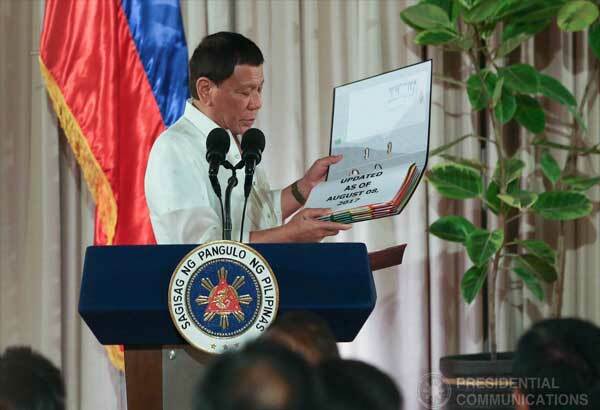 With his home city of Davao as his template, the President said he had believed he could also eradicate the drug problem nationwide in just six months. “Alam ko na nagkamali ako. Nagkamali talaga ako. Hindi ko naman talaga akalain, iyang Bureau of Customs na iyan, akala ko kaalyado ko (I know I made a mistake. I really made a mistake. I really never thought that Bureau of Customs, I thought it’s an ally),” he said in remarks before Ozamiz City police officers and men. Duterte also argued that the drug war has been curtailing the freedoms of citizens. The President cited the case of the Parojinogs, one of the political clans accused of having ties with drug syndicates. Police killed Ozamiz City mayor Reynaldo Parojinog Sr., his wife and several others on July 30 after they allegedly fought it out with policemen serving search warrants. “The people here (in Ozamiz) have tasted patronage politics... You will be next. Follow them and you will be next. I will not stop this... I said to the police and the military: destroy the apparatus, the organization of drug syndicates,” the President said. “Kaya ikaw ‘pag namatay kayo, ma-mayor ka, ma-congressman, gobernador ka, pasensya ka (Now, you die. If you are a mayor, a congressman, a governor, if you get killed, sorry). That is my order,” he added. He said in jest that those he would spare would be sent on a ship to the South Pole and left to fend for themselves. Duterte projected himself as a no-nonsense, tough-talking crime buster during the campaign, leading him to win the 2016 presidential race by a landslide. The longtime Davao City mayor, who vowed to suppress narcotics in six months, got more than 16 million votes, beating his more moneyed rivals, all of whom had previously held national posts. In September 2016, Duterte sought a six-month extension for his drug crackdown, saying he was shocked by the magnitude of the problem. He later admitted that the drug menace could not be solved easily and that the crackdown would have to continue until the end of his six-year term. “I said my critics were right. You said, when you become president, you can do it in three to six months. I was not aware of the problem when I assumed office. Davao was just my template. There were drugs there but if you bring drugs there, you will die,” Duterte said. “Now, you ask, the Philippines, are we or are we not a narcotic country? Yes, we are,” Duterte said. Thousands have died since Duterte launched his bloody war on drugs but figures released by the government and civil society contradict each other. Previous reports have placed the death toll at around 9,000 but police officials claimed only about 3,000 drug personalities have been killed in law enforcement operations. The anti-drugs campaign has drawn flak from human rights groups in the country and abroad but Duterte has refused to listen to his critics, whom he accused of trivializing the drug problem. “Human rights, wala akong pakialam sa inyo. May trabaho ako at gagawin ko (I do not care about what you say. I have a work to do and I will do it),” the President said. Duterte said his fight against illegal drugs would not spare anyone, not even his friends. “Walang kaibi-kaibigan sa akin. Either patayin kita o patayin mo ako. Pareho lang sa akin (Friendships don’t matter to me. Either I kill you or you kill me. It’s the same for me). Just stop playing with drugs,” the President said. Duterte reiterated that he would protect policemen who would face charges in connection with the drug war, even promising to pardon and promote them in case they get convicted. “My warning is this: do not lie to me. Just tell me the truth because there is always a remedy. In the performance of duty, you’ll have no problems,” he added. Duterte also warned policemen engaged in illegal drugs, saying he has offered P2-million bounty each for their arrest.